Knitting stuff and going on and on. : A very Big Thing! Sometimes being a spectator at an event in a small community has it's advantages. Little ones like Boyo aren't completely overwhelmed. Your Mother gets to sing in the choir, front and centre in a nice white shirt. 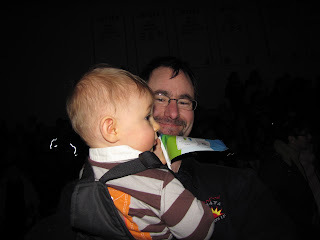 But best of all, your kid gets to hold the 2010 Winter Olympic Torch without waiting in line for more than two minutes. Politics aside, the excitement and bigness were palpable and awesome. I loved being there and getting to have my family up close and personal to something that momentous. Excellent! That's a night for everyone in the family to remember!! !